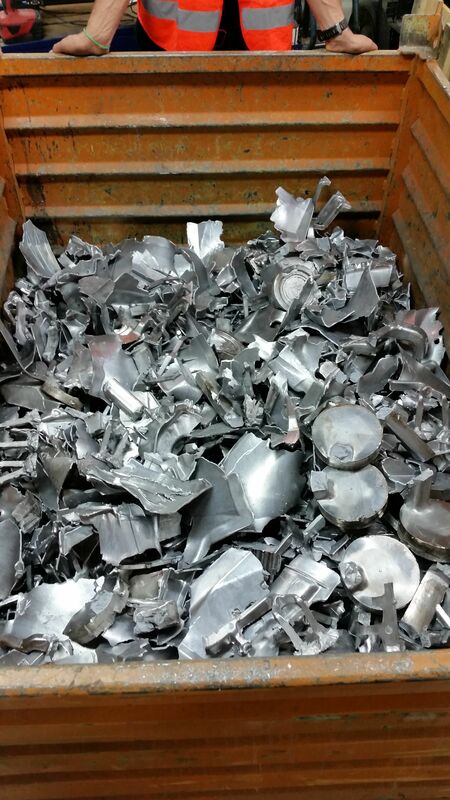 Special pre-shredder reduces scrap in aluminium foundry to manageable sizes and optimises intralogistics process. In the light alloy foundry at the BMW Group’s plant in Landshut, all scrap products such as punching waste and sprue systems are recycled and then remelted. For this purpose, the die-cast parts were previously collected in containers without being shredded and were removed from the basement of the foundry with considerable use of manpower. In the course of a renewal of the casting cells in the foundry hall, the work processes were optimised and more efficient processes set up. Erdwich Zerkleinerungs-Systeme GmbH was awarded the contract to design a plant that enabled the collection and shredding of the foundry’s aluminium waste directly from the press. For this task, the recycling expert adapted the RM 1350 pre-shredder to the local conditions. On-site shredding means that the containers with scrap parts and punching waste have to be transported far less frequently to a large container, which contributes to a significant increase in operating efficiency. In cooperation with the technical department of the BMW Group, Erdwich also developed a sophisticated safety system for monitoring the condition of the machine. According to Erdwich the light alloy foundry at the BMW Group plant in Landshut is one of the most modern foundries in the world. Every year, around five million aluminium casting components, such as engine components or structural components for the vehicle body, are produced there using five different casting processes, with a total weight of 84,000 tons. As in all areas of the company, the aluminium foundry works with maximum efficiency in order to keep the scrap rate as low as possible. In the past, the regularly occurring scrap was collected in containers without being shredded, removed from the basement and then returned to the melting process. The cast aluminium parts had dimensions of up to 2,000 x 1,400 mm and therefore took up a lot of space in the collection containers. This, in turn, meant that the containers had to be emptied frequently, which required a great deal of time and manpower. In the course of reconstruction measures in the foundry hall, during which the casting cells were replaced one after the other, it was planned to optimise the recycling process. Erdwich Zerkleinerungs-Systeme GmbH from Igling in Upper Bavaria, which has decades of experience in the construction of recycling plants, got the order to plan and commission the metal shredder, the company says. This was particularly beneficial for the project in Landshut, as Richard Adelwarth, project manager at Erdwich Zerkleinerungs-Systeme GmbH, reports: “When we visited the site, it quickly became clear that the solution required in the tender would not have the desired effect. We therefore carried out many trials and consulted another company in the industry, with whom we regularly work on larger projects in order to be able to offer an optimum solution.” Erdwich finally made a machine available with which a typical production process was executed. 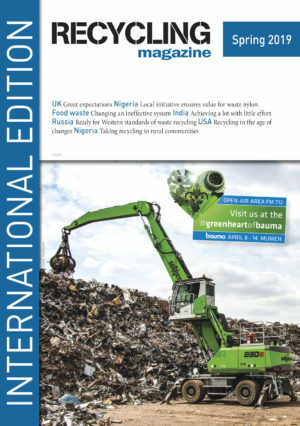 According to the company the recycling experts designed a machine based on the RM 1350 pre-shredder. This machine is characterized by fast and easy maintenance, long service life, optimum shredding and high throughput. To date, seven systems with soundproof enclosures have been installed for the eight casting cells and punch presses in the plant. “Loading takes place in free fall, that means the moulds, which are to be returned to the melting process, now fall from the pressing plant directly into the hopper of the pre-shredder and then into a container measuring 1,400 x 1,400 x 900 mm,” explains Adelwarth. When the container is full, it is transported outside, emptied into a large container; and this in turn is brought to the smelter. The shredding process has reduced the volume of cast parts by 50 to 60 percent, which means that the disposal containers have to be emptied far less frequently and thus require less time and manpower. According to the company the pre-shredders were adapted to the special conditions prevailing on site. The drives of the machines, for example, had to be mounted on one side instead of the usual two. The reason for this was the columns of the building, which were located in the area of the installation site and therefore required a narrower design. In addition, the crushing tools themselves and their arrangement within the cutting chamber were adapted to the local conditions. Over and above this, the standard version of the RM 1350 already has a safety system. This includes a PLC control system with automatic reverse and cut-out control, so that the machine is protected from damage in the event of overload or bulky solid parts. In addition, each shaft is equipped with an energy-optimized frequency converter, which ensures that the two cutting gear shafts are driven separately. This enables optimum adaptation to the shredding process. Together with the technical department of the BMW Group, the safety system was extended by new features. “Both the filling level of the removal box located in the basement and the monitoring of the shredder itself are now displayed transparently, so that a quick response can be made if necessary,” explains Adelwarth. As soon as all casting cells have been replaced, a conveyor belt system could be installed in a further expansion stage in order to further optimize the disposal process, the company quotes. Thereby, the shredded rejects would no longer to be collected in containers that have to be removed and emptied by hand – instead, the rejects would be transported directly into the large container via a conveyor belt. In this way, scrap products and punching waste from all casting cells can be disposed of simultaneously and without additional logistical effort. For the current expansion stage, all necessary alterations were quickly implemented so that Erdwich was able to meet the requirements placed on the machines. As a result, the work processes were considerably accelerated. BIR established Global Recycling Day in 2018 to help achieve its goal of greater international recognition of the benefits of recycling. Chemical company Sabic and british chemical plastics recycler Plastic energy intend to build a first commercial plant in the Netherlands to refine and upgrade a valuable feedstock, known as Tacoil, a patented Plastic Energy product, which will be produced from the recycling of low quality, mixed plastic waste otherwise destined for incineration or landfill .